So you have decided to get married. Congratulations! A wedding in church offers all the advantages of a civil ceremony and God’s blessing as well. We have a whole team of people ready to welcome you and work with you as you prepare for your marriage here: Organists, flower arrangers, vergers, clergy and cleaners, we are all dedicated to making your wedding day as good as it could possibly be and ensuring that everything goes off without a problem. If you live within our parish or have other qualifying connections ** then it is possible to be married in one of our churches: St Catherine’s, St John’s or St Luke’s. Please note, you do not need to be an active member to be married in church. It is part of our mission to be God's presence in every community and part of that means supporting all who would like to have their marriage and vows exchanged before God. Even more important than that, we believe, is the marriage that you are entering into. So we do our best to support you in your preparation for the wedding and for a lifelong relationship marked by mutual love, compassion and respect. We look also at what will most strengthen your future marriage as well as the teachings contained within the marriage service itself. So if you are planning to get married, and would like more details, please email or phone the clergy – click here for contact details. If you are getting married elsewhere and live in Canton or Riverside you will also need your banns to be read in one of our Churches. Please contact the clergyfor more information about this. 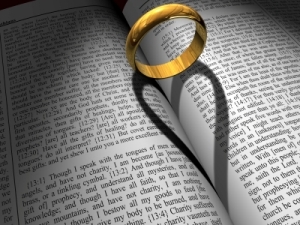 For more general information on Marriage in church click here. ​- that a parent or grandparent had been married in the parish.